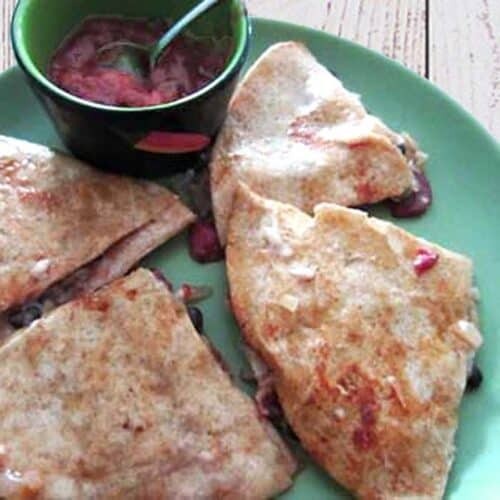 Roasted Red Pepper Quesadillas are both protein rich and delicious, filled with black beans, roasted red peppers, bacon & oozing with cheese. Cook bacon until crisp in medium non-stick skillet. Remove bacon. Skip this step if going completely meatless. Add onion and garlic to bacon fat (or olive oil if going meatless) and saute until soft and translucent, about 5 minutes. Add roasted red peppers and saute for an additional 2 minutes. Remove vegetables from pan and let them drain. Wash pan clean and make sure to dry it well. Place pan back on burner and heat over medium high heat. Place 1 tortilla in hot pan and brown on one side. Repeat with other tortillas. For the next part you will have to do one quesadilla at a time unless you have 2 pans you can use. Return 1 tortilla to pan with uncooked side down and spoon 1/2 of the vegetable mixture, black beans, crumbled bacon and cheddar cheese on top. Cover with other tortilla, cooked side down. Press down with a spatula. Cook until the cheese just starts to melt and the bottom of the tortilla is browned and crisp. Using a large wide spatula and your hand, carefully flip the quesadilla. Cook until the other side of the tortilla is brown and crisp and cheese is completely melted. Remove from pan and repeat with other 2 tortillas. Cut each into wedges with pizza cutter. Serve with sides of salsa and sour cream or plain yogurt.